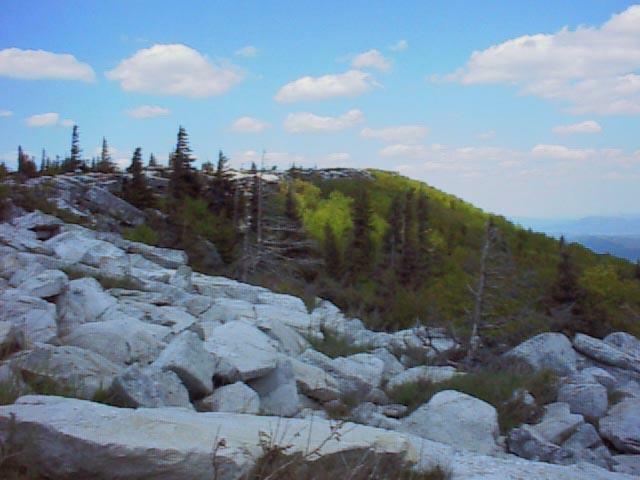 As Rachael mentioned in her story of Thunder On The Sods that was posted on September 18th and 19th, the Dolly Sods was used during World War II for military exercises. Some live mortar shells remain buried in the soil. The shells are definitely out there. The Forest Service gives one explicit directions regarding mortar shells being discovered. If you should happen upon an unexploded shell, DO NOT TOUCH IT. Nitroglycerin, a component in the gunpowder charge, settles over time and can become extremely volatile. Moving the shell may cause the mortar to explode. Mark the location, draw a map of how to find it, and contact the District Ranger in Petersburg as soon as possible. While discoveries of shells are extremely rare, they are still being located on occasion by hunters and backcountry travelers. It is such a contrast - nature and military exercises. 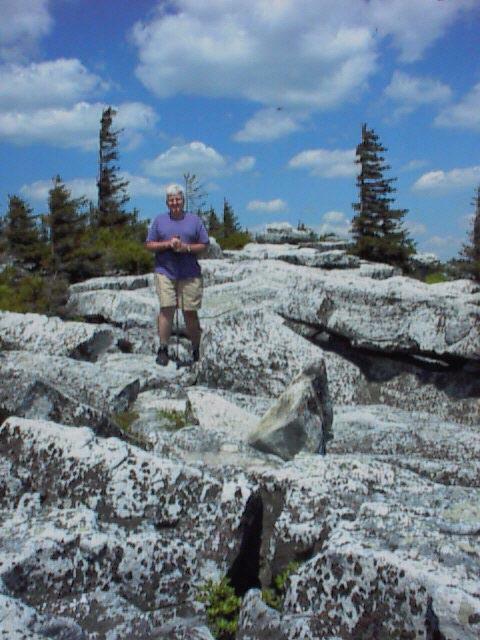 I have mentioned earlier that a very spiritual place for me is Dolly Sods. Throughout my life, this area has touched the inner most corners of my soul. Dolly Sods is an area of high elevation wind-swept plains on the Allegheny Plateau. At elevations of 2,600 to over 4,000 feet, the area has extensive flat rocky plains, upland bogs, beaver ponds, and sweeping vistas. The plant life and climate on this high plateau resembles northern Canada, and many species found here are near their southernmost range. The 10,215 acre wilderness was designated by Congress in 1975 and is located in West Virginia's Tucker and Randolph counties. The high plains area was once covered with 7 to 9 feet of humus. This humus layer was formed under a red spruce/hemlock forest - a forest where the average tree was four feet in diameter. Sadly, these once stately giants were felled during the timber rush of the late 1800's. Hot fires in the logging slash burned the area extensively and destroyed the fertile humus layer. In the inhospitable climate and present rocky soil of Dolly Sods, red spruce now struggle to attain 12" in diameter. About the time the slash fires raged, local farmers burned the plains to create grazing land or "sods". The pioneer Dahle family used the sods for grazing about the turn of the century. 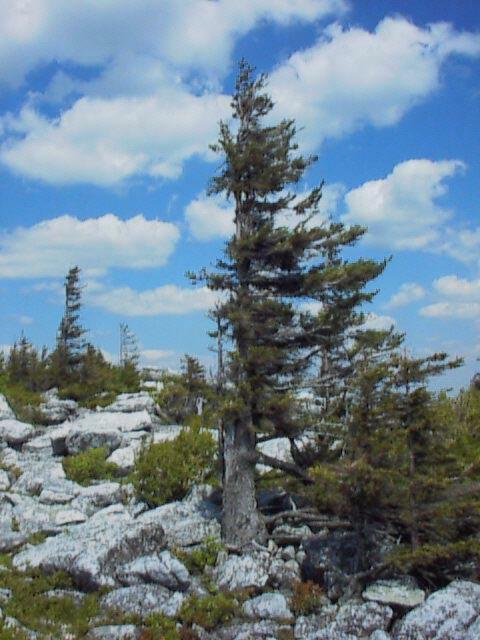 Their German name became the present "Dolly" of Dolly Sods. The Civilian Conservation Corps planted red pine and other conifers in the area in the 1930's and assisted with the construction of Forest Road 75, now the main access into the Wilderness area. In 1993, the Nature Conservancy purchased a large tract of land just north of the Wilderness Area from Quintana Corporation, a Texas oil company. This key purchase dramatically expanded the high plains region, following in a rough arc from Bear Church Rock to the north-western tip of the present Wilderness located near Cabin Mountain. I explained on my last posting that I always cherish the meals at The Hutte [“little house” in Swiss–German] Restaurant in Helvetia. I also pointed out that both The Hutte and the Bee Keeper’s Inn are owned and operated by a truly special lady, Eleanor Mailloux. Eleanor grew up in Helvetia in the early1920s, left to travel the world with the American Red Cross, and came back in 1963 with her five children to help nurture the fragile culture of her childhood. Helvetia is about as far away from anywhere as one can get in the southern Appalachians, which makes it hard to fathom how a small group of Swiss and German settlers, most of them professionals and tradesmen, were able to carve out a community here in 1869, in a stretch of West Virginia which, even today, looks like pure wilderness. They came via Brooklyn, N.Y., lured by newspaper advertisements that proclaimed the immense natural beauty of the Mountain State. 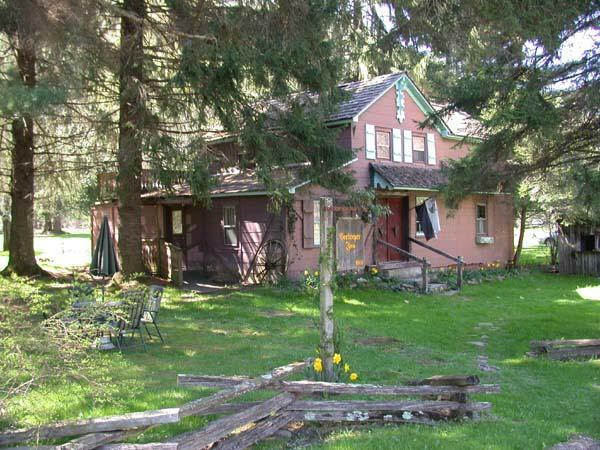 They managed, with some help from Scots-Irish neighbors, to establish farms and to learn to hunt and fish. "They were under the impression there was a village here," says Eleanor, "But there wasn't. It was just wilderness." 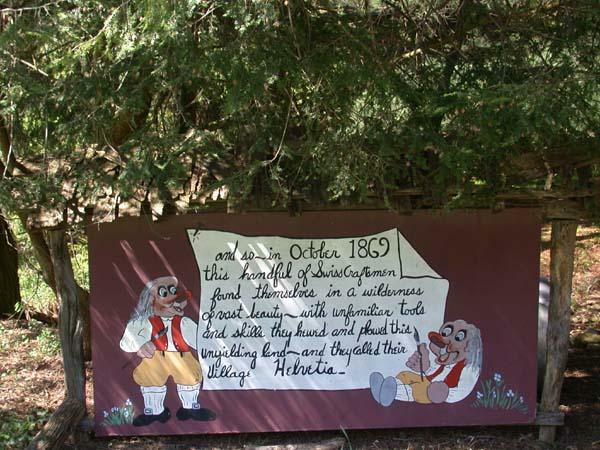 In 1875, Helvetia boasted a population of 308. Today the town itself is home to about 20 people, but about 125 more live on the outskirts, all of them descendants of the first settlers. "There are only three or four pure Swiss left," Mailloux says. "Most of us are watered down." In the comfortable, rambling restaurant, the Hutte serves some of the most divine Swiss cheese you'll ever taste. 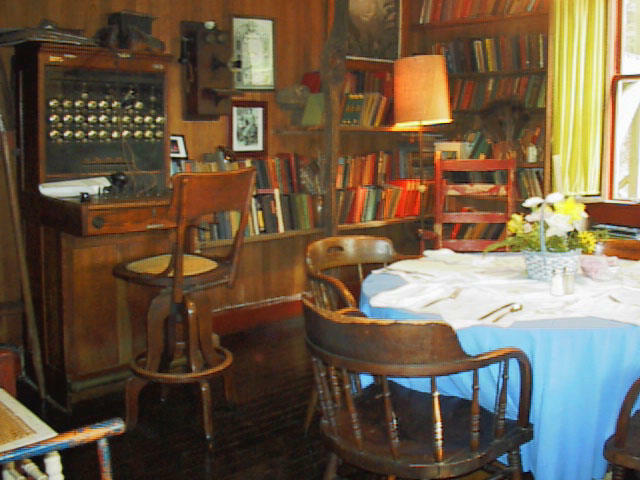 The antiques that line the walls — an old telephone switchboard, hundreds of dusty books on sloping shelves, old cradles, an antique organ and other furnishings — once belonged to Helvetia's residents. 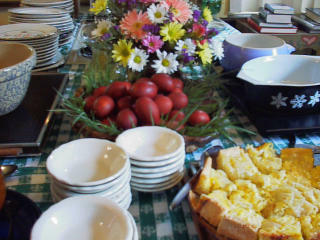 I have included some photos of her luncheon meal we experienced one Easter Sunday. She fixed lamb and it was wonderful! (Many West Virginians are never tasted well-prepared lamb. Most turn up their nose and say, “I hate mutton!” A true morsel of lamb has never graced their taste buds.) Notice the eggs are colored using onionskins, which gives them that beautiful mahogany color. Typical fare includes fresh cheese, homemade bread, bratwurst, amazing sauerkraut made with her unique seasonings, and even the applesauce is a special recipe closely guarded by Eleanor. Eleanor is an amazing person whose energy is awesome. It was a great fall day. As I drove the winding road, crimson leaves were scurrying across the road in front of me. I had just visited Pickens School. 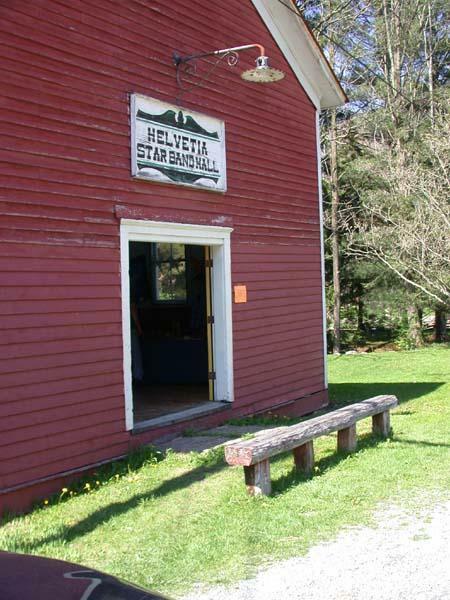 Returning from Pickens, you go through the wonderful Swiss hamlet of Helvetia. 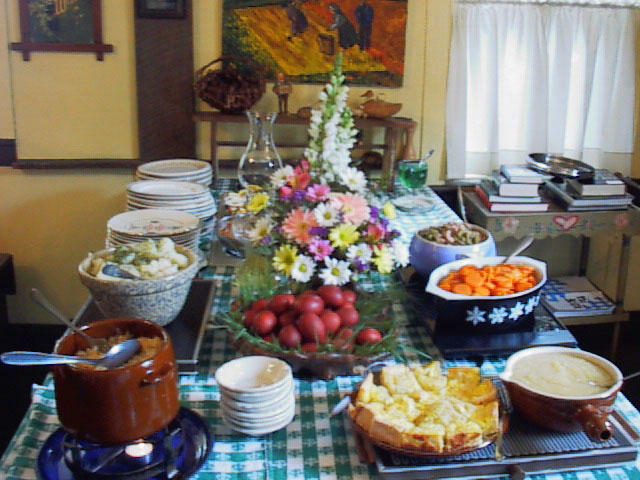 Authentic Swiss traditions are well-represented in the Potomac Highlands of West Virginia. 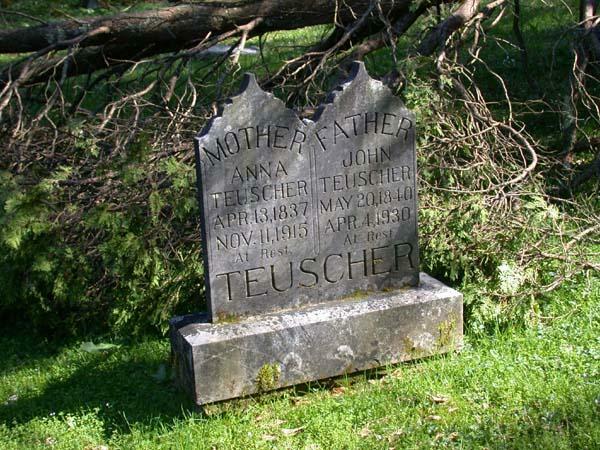 At one time there were three Swiss colonies in Randolph County: Helvetia, Adolph, and Alpena. These were established in the late 1800's. Helvetia, first settled in 1869, is the most isolated, and the community still carries on Swiss traditions brought over by the original settlers including farming, foodways, music, dance, and festivals. The rich cultural heritage of the Swiss in Helvetia has been well-documented, and numerous activities throughout the year continue to bring these activities to the public. Swiss foods, furniture, songs, and proverbs are all part of this rich heritage. Fasnacht, a Mardi Gras celebration and costume ball, is held the Saturday before Ash Wednesday. A community fair features a parade to commemorate the procession of cows down from the Alps at Summers end. The Helvetia Folkdancers exemplify Swiss cultural influence in music and dance. Bruce Betler is a most talented local fellow. The wife and I took a yodeling workshop from Bruce. He yodels marvelously. We still sound as if chickens are being strangled! Food is an important aspect of the traditional lifestyle in Helvetia of which cheese making was at one time an important activity. 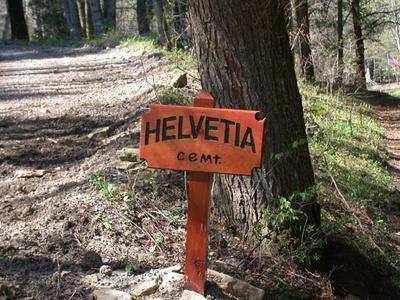 (Helvetia also has a great ramp festival in April.) I stopped at one of my favorite places to eat. 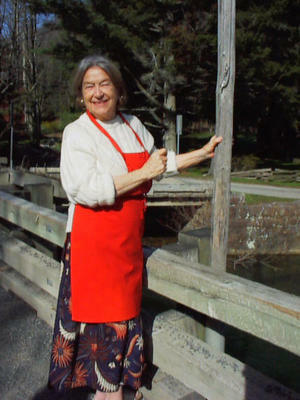 Eleanor Mailloux has operated the Helvetia Hutte Restaurant for decades. We have stayed in her Bee Keeper’s Inn - truly a wonderful taste of the past. 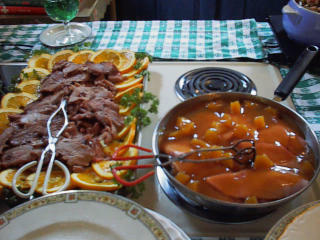 The food that Eleanor prepares is superb. In addition to the great gourmet offerings, her unique charm permeates the valley. 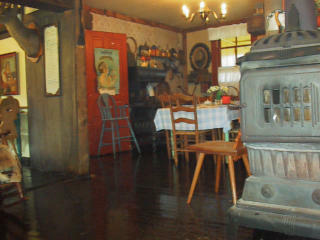 As I was eating, a couple came into the restaurant, which is decorated with local antiques. They wanted to see Eleanor Mailloux (pronounced MAY WHO). Eleanor introduced herself. Seems this fellow was from Germany and Eleanor had stayed with his family while she was in that country. The man was the 12th of 12 children and his father is still living in Germany and will be 107 years old on November 2nd. He still lives by himself. As I was eating my lunch, I wondered if the spices in this meal would extend my life and, if I had not had a vasectomy, would I have had a dozen kids? Strange thought as I devoured the last of the fried potato fritter. This week I had the opportunity of driving to one of my favorite places in West Virginia. I visited the Elementary/High School at Pickens in Randolph County. There is no doubt that this is the most remote and smallest of the public schools in the state. The school has a population of approximately 40 students in grades K through 12. The students are taught by seven teachers. The school is a visit to the past. The small white wood structure with coal powered boilers and oiled wooden floors is truly unique in this day. 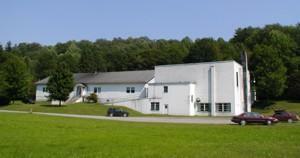 Even though this school is small, it has been named this month as one of the 2005 exemplary schools in West Virginia. This distinction is not new to this school. This is a real credit to the learning and teaching going on here. It is always great to see the Pickens School’s yearbook. As you could guess the graduating class takes up a page or two with the students getting very large photos. There will be a new school at the site and it is already under construction. The photo below shows the new school after completion. 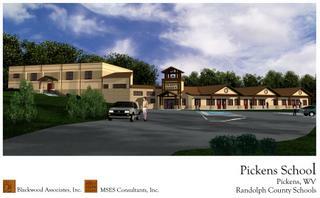 Pickens came into being in the 1890s and the first sawmill was located in the town in 1891. By 1892, a railroad was running to Pickens (Incidentally, the day railroad service began on July 4, 1892, it snowed in Pickens!) The town is located on the right fork of the Buckhannon River, and is the home of The West Virginia Maple Syrup Festival. It has a great community ramp dinner in April. Yummy!! (OK- Click on the photo to hear the ole Appalachian tune, Red Wing!) Thanks, Lee. 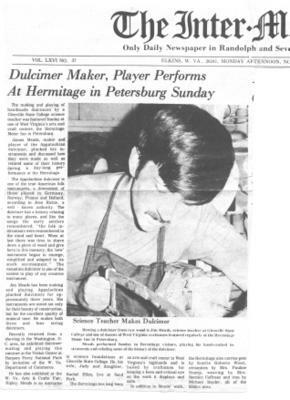 This article appeared in The Inter-Mountain, Elkins, WV, on November 13, 1972. Yes, a daily paper at that time costs 10 cents! The making and playing of handmade dulcimers by a Glenville State College science teacher was featured Sunday at one of West Virginia’s arts and craft centers, the Hermitage Motor Inn in Petersburg. James Meads, maker and player of the Appalachian dulcimer, plucked his in­struments and discussed how they were made as well as related some of their history during a day-long per­formance at the Hermitage. 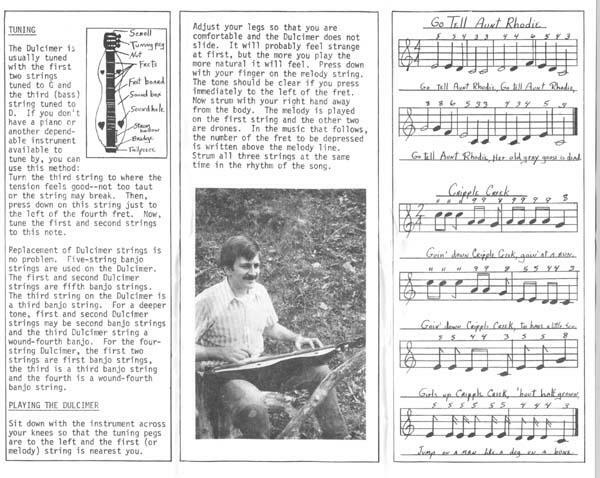 The Appalachian dulcimer is one of the true American folk instruments, a descendent of those played in Germany, Norway, France and Holland, according to Jean Richie, a well-known authority. 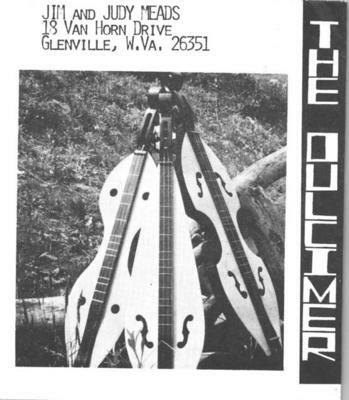 The dulcimer has a history relating to many places, and like the songs the early settlers remembered. ‘‘the folk in­struments were remembered in the mind and heart. When at last there was time to shave down a piece of wood and give form to this memory, the ‘new’ instrument began to emerge, simplified and adapted to its stark environment.” The mountain dulcimer is one of the easiest to play of any creative instrument. Jim Meads has been making and playing Appalachian plucked dulcimers for ap­proximately three years. His instruments are noted not only for their beauty of construction, but for the excellent quality of musical tone. He makes both three and four string dulcimers. Recently returned from a showing in the Washington. D. C. area, he exhibited dulcimer making and playing this summer at the Visitor Center at Harpers Ferry National Park by invitation of the W. Va. Department of Commerce. He has also exhibited at the W. Va. Arts & Crafts Fair, Ripley. Meads is an instructor in science foundations at Glenville State College. He, his wife, Judy and daughter Rachael Ellen, live at Sand Fork. 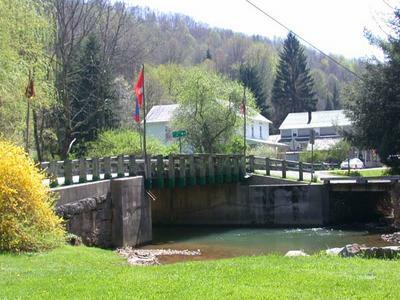 The Hermitage has always been an arts and crafts center in West Virginia’s highlands and is hailed by caraftsmen for keeping a keen and critical eye on the work it displays and sells. In addition to Meads’ work, the Hermitage also carries pots by Scottie Roberts Wiest, ceramics by Mrs. Pauline Stump, weaving by Mrs. Bernice Coffman and iron by Michael Snyder, all of the Elkins area. Yes, for several years my Dad and I made lap dulcimers. Here is part of an old brochure that may bring you some chuckles. We sold our instruments mainly at The West Virginia Arts and Crafts Fair at Cedar Lakes outside of Ripley.